On April 28 and 30th, I went up to Montebello OSP again to go after a different target since it's galaxy season. The Coma Cluster was well placed high in the sky and allowed good tracking across the zenith. 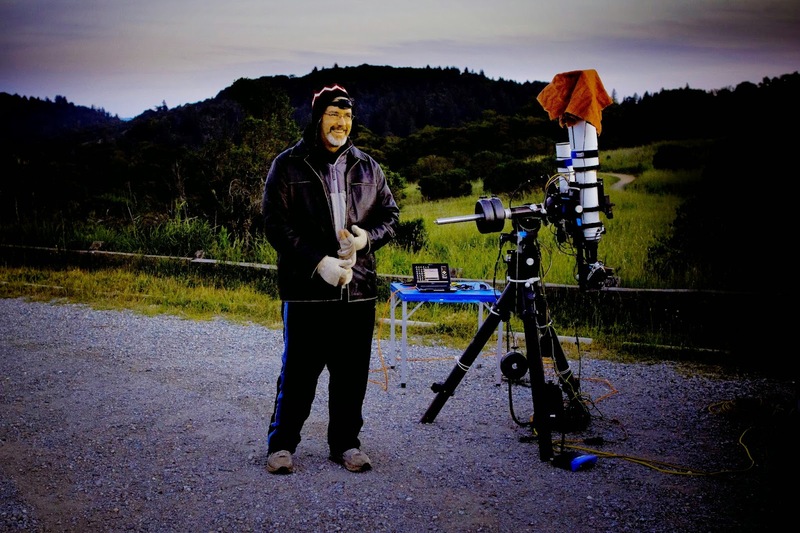 The weather both nights was plagued with some high clouds that marred otherwise dark skies. The seeing on the 28th was pretty good, not so great on the 30th. Because of these factors, the amount of usable data was reduced. Still was able to gather enough for 6 hours of integration. Carl Larson snapped that picture at dusk as I was taking 64 flats to bridge the two nights. Exposures are 1/45 second at 100 ISO using the light panel. The towel is to control light leaks that might come in from the edges. The configuration seen in the photo is how I go to the field. Note the amount of layered clothes for the funny shot (it was 60F and overdressed). In the winter, I wear long underwear, jeans, and the lined windbreaker pants, with 4 or more layers on top with a leather jacket along with a scarf and two hats. I try to stay warm and sometimes even all this is not enough and must retreat to the car for a blanket. Lastly, the sensor plane is tilted. 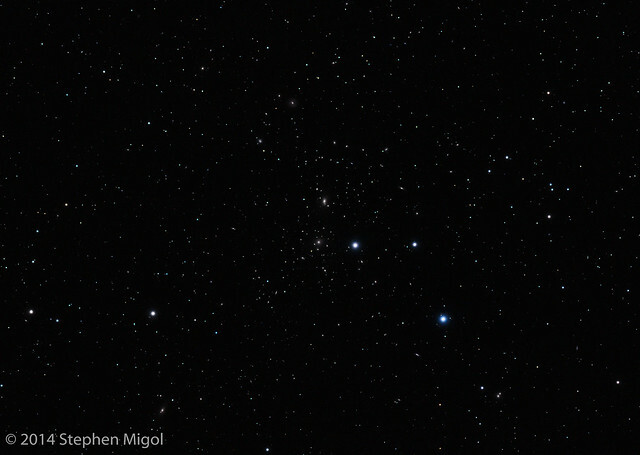 I was able to see this tilt by taking a picture of M44 (Beehive Cluster) with the bahtinov mask in place. Obvious skewing of perfect focus was easy to see. I found that focusing for the "top" of the field and then locking the camera in place, then turning the focus knob "out" a little was enough to fix the skewing. This error may be because of the hot glue on the floating sensor or it might be due to the tilt of the feathertouch focuser. I'm inclined to think it's the glue.